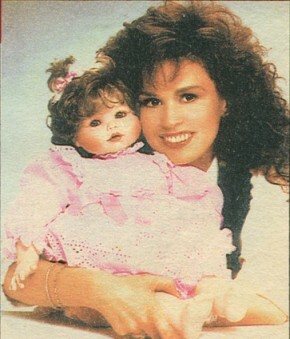 The Marie Osmond Fine Porcelain Doll Collection debuted at Disney World in 1991 with a parade and Mickey Mouse. The first Jessica doll's hand prints were done in cement. Here's Marie holding Jessica with everyone's favorite mouse, Mickey. Jessica is Marie's oldest daughter and the doll was done in three verisons. Here Marie is holding the first Jessica in pink. This photo shows Marie holding all three Jessicas; the original in pink, birthday in blue and Christmas in red and gold. Here's Marie with Baby Marie in vinyl dressed in white with blue flowers and also holding Daisy, which is a face Marie sculpted.